We’re actually available for painting your miniatures ; unique pieces, big scale projects, a boardgame or a Wargame army, you can write to us at wondercat@kaboum.fr to get an estimate. We can paint your minis or games that you sent to us, or we can purchase directly what you need and save you some shipping cost. Each project is unique and will need a different amount of time, and therefore will have a different cost, depending on several criteria : complexity of the miniatures, number of identical models, desired details… the easiest is still to write to us to get an idea. We should be able to fulfil the majority of orders within a month. In any case, what matters most to us is to send a paintjob we can be proud of , even if that means we need to go beyond our time estimate : we’re detail-oriented and painting is a passion. We’d rather put in extra hours for no additional charge and give a miniature the attention it deserves rather than just doing our mandatory hours and send a piece we’re half-happy about. Shippings costs towards France are about 6€ to 13€, and around the worlds vary around 13€ and 25€ for most projects. 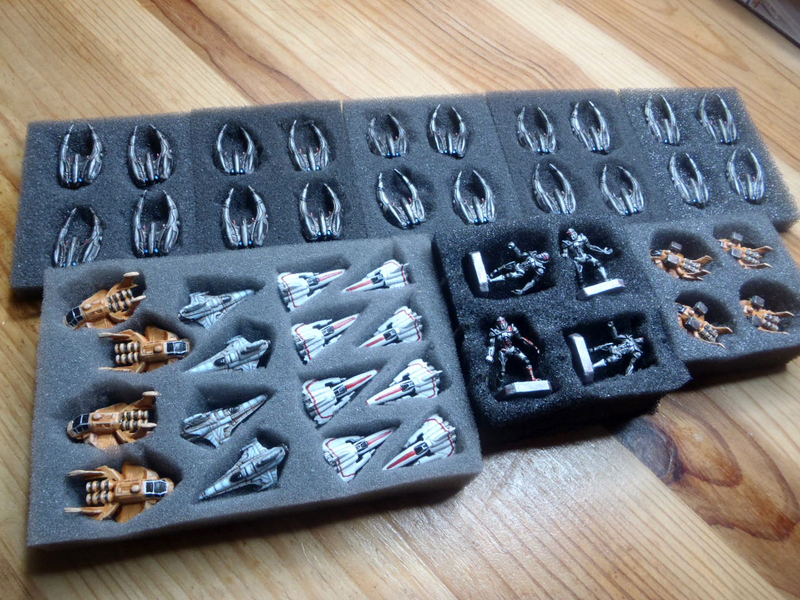 Of course we ensure that the miniatures will travel comfortably and will reach their new home safe and sound. I have been looking online through many websites, I wanted to get my adorable mice and mystics painted, I came across your site and automatically fell in love with the quality and attention to detail.. one of the main reasons I wish you guys could paint my minis is because while many sites charge a premium per figure quality ranging from dipped quality to exhibition quality and many different qualities in between.. I tend to see a flaw in that, I think there should just be two qualities standard paint job and than a more detailed superb job where care and love is given to the pieces.. having many different prices and quality levels seems a little weird to me.. I feel that you guys are passionate and care about the figures.. and if you are still taking orders I would love to know if I can sign up and be place on the wait list…. We’re not big fans of “levels” either, though they may be useful to put words on the difference there would be between let’s say the main mice of Mice & Mystics and the mere cockroaches. Hi! I’d like to get 4 custom mini unpainted for zombicide. How much it cost? And how many days to do that? Hi Glauco Buda ! I sent you an e-mail. What would the sort of price be for well painted full (base game, expansions and kickstarter exclusives) arcadia quest cost? Hi, what would it cost to paint a whole set of KIngdom Death miniatures (just like you did it for you – all black with minimum color). Your work is beautiful and very mood enhancing. I’ve sent an email to the above e address and look forward to hearing from you. Keep up the wonderful work! I am a backer of the last campaign of Kingdom Death and I am looking for a new painting-service. Could you make me an offer for the survivors and different sized monsters (a rough estimation would be enough in this case). Please with some pictures of the quality that I would get. I would like them to be painted in a more traditional scheme. Maybe with nmm for metalparts (there aren´t that many of them on most miniatures) and osl for the lanterns. Usually I build the miniatures myself. Greetings I just received the Kingdom Death 1.5 Core set and I was wondering what you might charge to have it painted?